As I’ve mentioned before, I take my lunch to work most days. Occasionally I’ll pack leftovers from earlier in the week, but I usually prep my lunches on Sunday afternoon or evening so that I can grab and go in the mornings. Meal prepping can sound like a lot of work, but it’s actually an easy habit to get into, especially if you pick the right recipes. 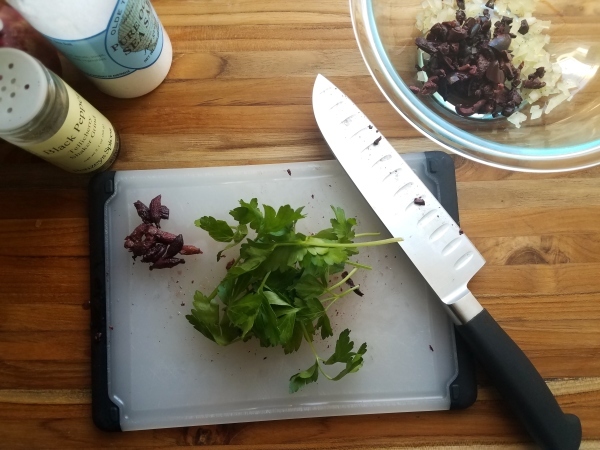 I like to pick things that are quick to make, will last multiple days in the fridge, and that rely on ingredients I usually have in my fridge or pantry. 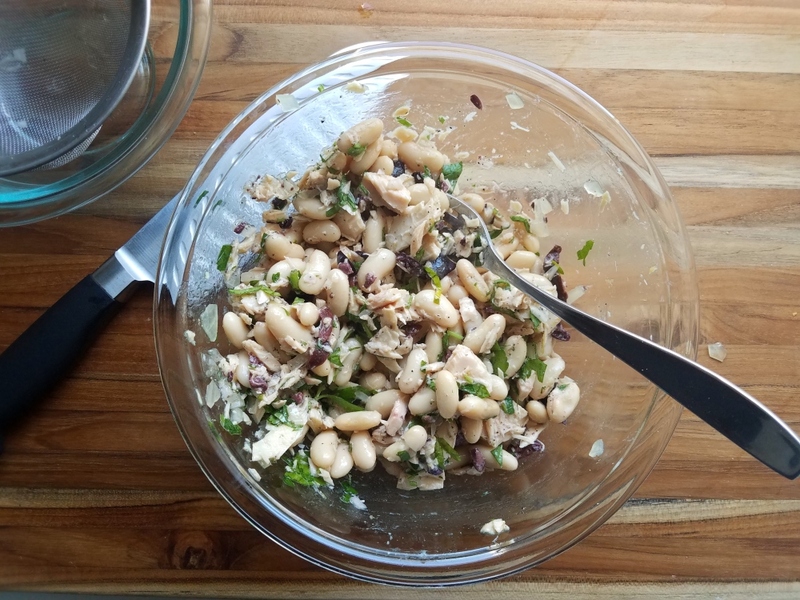 This tuna and white bean salad checks all of those boxes. 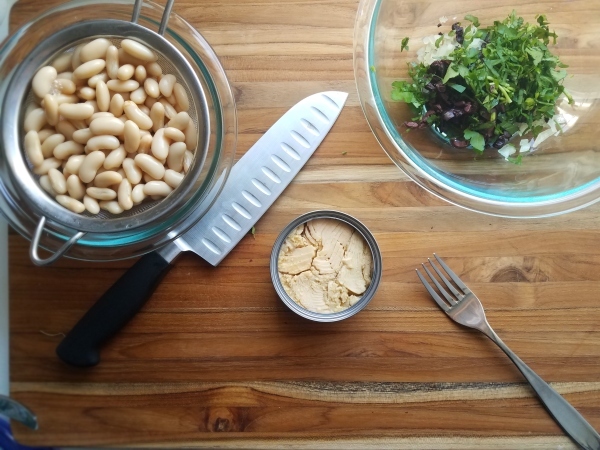 Tuna and white beans are a classic combination and because they both come canned, they’re easy to keep on hand as pantry staples. I brighten the tuna and beans up with olives, onions, and lemon zest/juice, all of which are also ingredients I almost always have in my fridge. Sundried tomatoes or roasted red peppers are also great in this, but not necessary. To finish, I either serve the salad on top of a bed of kale or spinach or as a sandwich filling. 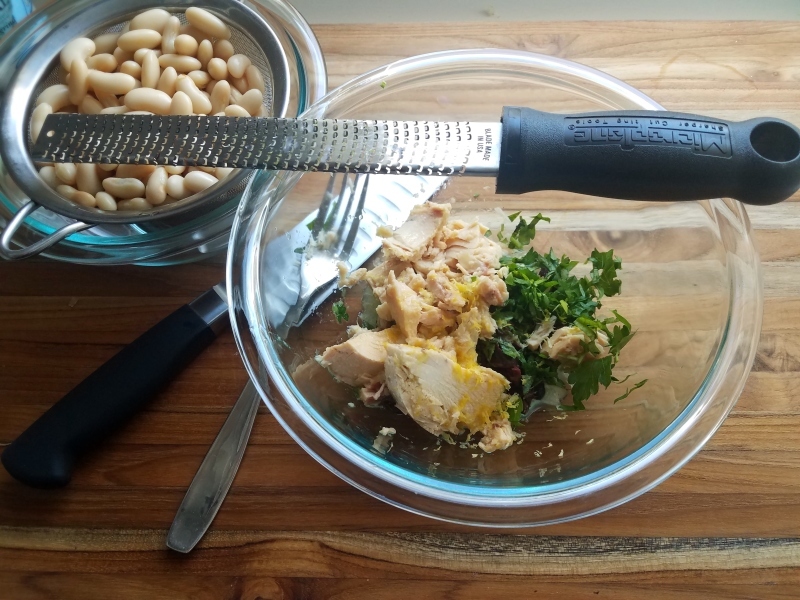 The tuna and white bean mix, if prepared on Sunday, lasts until Friday. 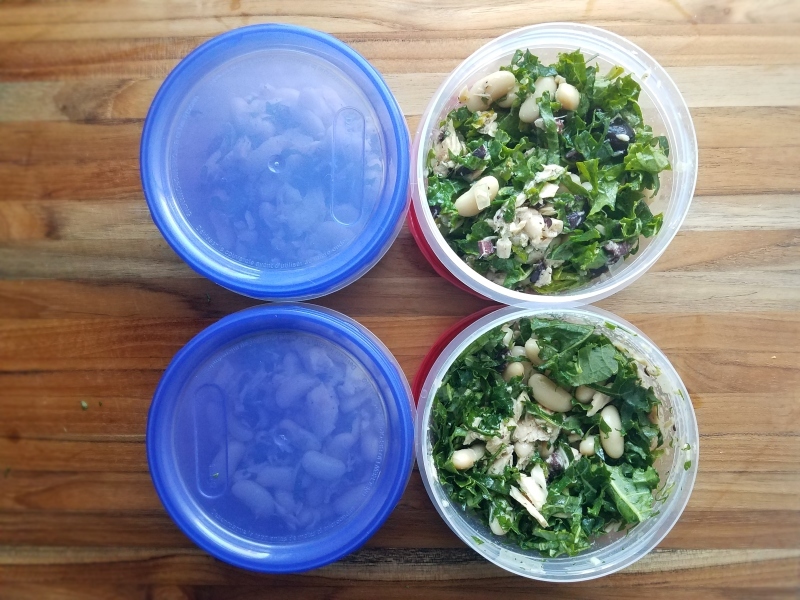 If I am serving the salad on top of greens, I usually prepack the salads (with the tuna and beans mixed right into the kale, or with the spinach loosely laying on top of the tuna and beans) no more than 2 days in advance, to keep the greens from getting too wilty. When lunch time comes around, I just give my salad container a quick shake to recoat everything with the dressing and dig in! Using a fork, flake the tuna (including the olive oil) into a small or midsize bowl. Add in the remaining ingredients and stir to thoroughly combine. Give it a taste and adjust salt, pepper, lemon, and oil to taste. Typically, I add a little extra lemon juice. Finely chop the kale, sprinkle it with a little salt, and massage gently (the way you would knead dough) until the the leaves darken slightly. If eating immediately, add kale to the tuna and bean mix, toss to incorporate, and serve. 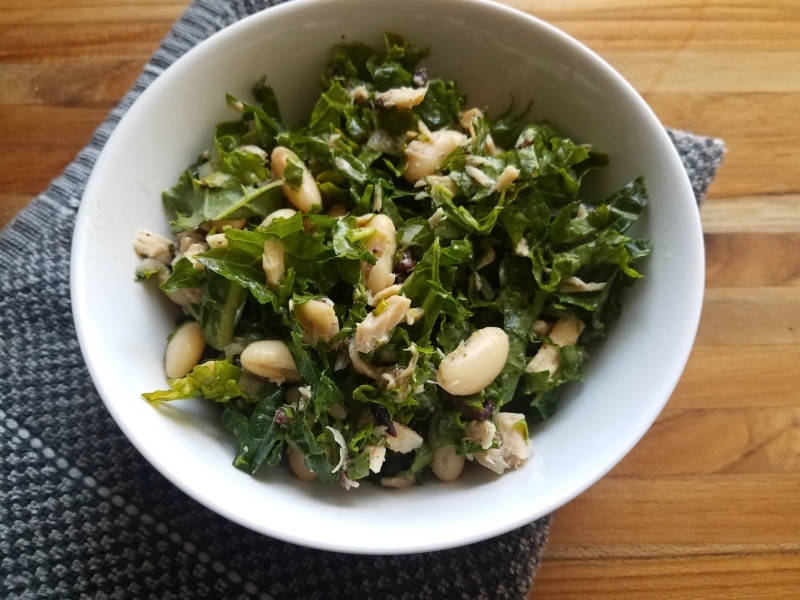 If eating later, you can mix the kale into the tuna and beans 2 to 3 days before eating. The tuna and white bean mix (without the kale) will last for 4 to 5 days. The olive oil that the tuna is packed in forms the base of the salad dressing, so make sure to buy good quality tuna and to ensure that it’s packed in olive oil rather than canola or veggie oil.